Some of you may recall that we had received the first Ranger in Time book (linked to review) earlier this year. I did a quick flip through of that book and decided it looked good enough to pass along to my oldest, Bookworm1, age 8. I also mentioned at that time that there would be a second book released in the series entitled Ranger in Time: Danger in Ancient Rome . I made mentioned of the fact that I would likely want to read that one before handing it over to Bookworm1 to ensure that it wasn't too, well, descriptively gory. It being about Roman gladiators, I knew I'd want to check it out first. 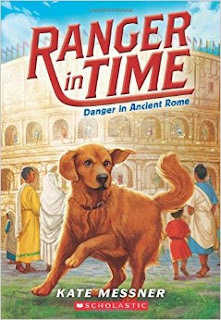 Ranger in Time: Danger in Ancient Rome arrived and I absolutely did decide to read it before allowing Bookworm1 to. It's not that I don't trust him or that I'm trying to shelter him unnecessarily. In fact, I do not want to shelter him unnecessarily! I do want to make wise decisions in protecting him from things which he might find presently disturbing with the idea in mind of exposing him to certain aspects of history when he's a little older. No need to rush him too quickly, in my opinion. So many kids these days are exposed to violence early and often and frankly we don't want that for our own kids. We want them to know what happens in the world (and why) but we don't feel like they always need to see or experience something for themselves to know that it is true or wicked or evil. I wish to quickly add that I absolutely love this idea for a book series. I think Kate Messner is onto something here in making history more appealing to children through the idea of a rescue dog experiencing time travel. It's an engaging plot. I do think Bookworm1 would enjoy it in all of the right ways. However, We The Parents have talked about it and decided to hold off on giving him this title for one year. Reason? He is a more cautious person by nature and disturbs easy. (e.g., He loves Harry Potter, but can't bring himself to watch the movie yet - even though it has been offered - because of viewing Voldemort. Voldemort is just the right scary in his mind. He doesn't want to see him pictured on screen.) Simply put, Bookworm1 has a great imagination and he knows it. He disciplines himself well enough for me to know that he'll agree with waiting on this particular Ranger in Time title. You should know that given the subject matter, I think Messner did a fantastic job at describing life in Ancient Rome and talking about what being a gladiator really meant. I was not left with the impression that it's a fun life. Messner does not try to glorify the life of gladiator. She's horrified by the games herself and wants to tell kids about what they were like without making something of them that they were not. She writes this series for ages 7 to 10 and I think she handled her material in a very appropriate way. The story is tense (because, come on!) with lions attacking and gladiators fighting. This is to be expected; she paints the scene well. She's not trying to frighten her readers, just educate. It's not over the top. So, then why are we holding back with our son? There is one fight scene between two gladiators that we felt was just a little on the edge. One young man is fighting another, more experienced, gladiator. In the process his arm is slashed with his opponent's sword. Blood and sand are mingling. Then in the struggle his arm is slashed again, deeper still. More blood mentioned. Again, it is not unnecessarily gory. But it does bring the imagination fully to life! Due to the fact that scary images (either on a screen or in his own mind) disturb my oldest, I'm not going to set this before him just yet. I am, however, going to keep this on the shelf and after some time has gone by. When he shows that he can handle more intensity, I'll give this over no question. But for now, we'll take a pass. If you are curious about the book, know that the most tense scenes are a lion which begins to attack a boy (but who is distracted away by Ranger) and the gladiator fight scene. Everything else is pretty low key. Just like in the first book, there are historical notes written by Messner at the conclusion giving the reader more information about Ancient Rome and Rome as it looks today. While I'm not handing this one over to Bookworm1 immediately, we will look forward to the third book in the series, Ranger in Time: Long Road to Freedom about the Underground Railroad. I can't think of a single reason I'll need to preview that one before giving it to him. Long Road to Freedom is due out December 2015. Many thanks to Scholastic Books who sent a copy of the above title my direction in order to facilitate this review. I have received no additional compensation and all opinions are 100% my own. I'm glad you're being careful with your son. Too many children are exposed to too much, too soon. Children are young for such a short time. Treasure his childhood, and let him be a child. The series sounds intriguing. I was never interested in history when I was in school, but I am now. I think my interest was triggered by historical fiction; it has spurred me to look up facts on my own. You do know that there was much violence and suffering during slavery times in the US? Horrendous things that have stayed in my mind years after reading about them. I think you should preview this book as well. :) Yes, I am aware that there was much violence in the time of the Civl War era. We're actually just about to delve into our Civil War studies. In light of the present day I think it's a good thing to look into this subject matter. I've been collecting children's books on the topic and I haven't found a single one that makes the situation too gory. Unpleasant? Yes. You can't get around that. I don't want to hide history from them. But I do want to preserve their sensitivities as long as is possible. IF Messner had mentioned simply that one of the Gladiators had slashed the other's arm with a sword and left it at that, we wouldn't hesitate to let him read this book. His imagination can fill in the blanks. But since there was a reference to blood and sand mingling, that is a little TOO helpful to the imagination and that's the wobbly line on which we've decided to be cautious about. So learning about the harsh treatment of slaves is not something I would try to spare them. Unless I find something that really gets too gory in which case I would try to find a different resource for them to use while they are young. I know you're a wise parent. I'm sure you will handle it well. I think you're handling parenting with books well. This definitely sounds like a good series for youngsters. Thanks for sharing!